This post is long overdue, but I had problems with my camera and couldn’t get the photos and video off it. I managed to sort it out somehow now, so let me tell you a bit more about the Talking Kitchen that we were sent by Chicco a couple of weeks ago. The Talking Kitchen by Chicco is an educational toy that helps your child develop different skills, such as language skills as well as hand-eye-coordination and imagination. It is bilingual and let’s your little one discover words and phrases in English and French. Altogether, there are three different modes that encourage children to discover the different parts of the kitchen. There is a smoothie maker, a toaster, a hob and an oven as well as a sink and a tap. All parts of the kitchen allow children to develop different motor skills such as opening, shutting, twisting, turning and pushing buttons. The great thing about this toy is that it rewards successful actions with a fun tune or little song that encourages little ones to explore further and prepare food such as a smoothie, some toast or a fried egg. Obviously, the Talking Kitchen won’t teach Amy any advanced French vocabulary, but it will certainly help her to get used to the sound of another foreign language on top of the English and German that she hears at home and that can only be a good thing. Overall, this is a great toy for toddlers. It’s interactive, fun and instantly grasps children’s attention with its colours and sounds. It doesn’t make a good omelette, but Amy seems happy enough trying to cook up a feast for mummy and daddy. 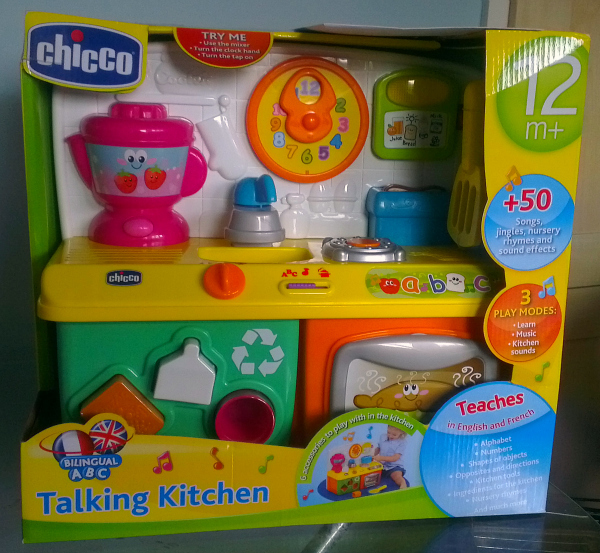 Chicco’s Talking Kitchen retails at £39.99, but if you keep your eyes open you might find it on offer at the moment. It definitely would make a fab Christmas present for your budding chef. Chicco are currently running a Happy Moments campaign, which gives you four different experience vouchers, if you spend £29 on Chicco products before the 15th December. I have my eye on the pamper voucher, but you could also try out extreme sports, crafts sessions or family day outs. Disclosure: I am a member of the Mumsnet Bloggers Network, a group of parent bloggers picked by Mumsnet to review products, services, events and brands. I have not paid for the product or to attend an event. I have editorial control and retain full editorial integrity. Looks great fun for younger kids!